The ceasefire in the US-China trade war is over. As Fox News reported late on Tuesday, Trump rejected Beijing's trade negotiation olive branch, saying that the proposed $80BN in agriculture purchase commitment from China was insufficient, and resetting bilateral trade talks back to square one. In related news, Politico reports that Trump is expected to impose tariffs on Chinese goods as soon as Friday or next week, "a move that is sure to further inflame tensions and spark almost immediate retaliation from Beijing." As discussed previously, on Friday the administration is planning to publish a final list of Chinese goods that will take the hit. Trump's China trade advisor, Peter Navarro, said on Tuesday that the president is planning to impose tariffs on a “subset” of Chinese imports that the administration included in an original list of roughly $50 billion in targeted products in April. Navarro’s comments suggest the Trump administration will move forward with tariffs but that it could impose penalties on a smaller group of products than those included on the original list of about 1,300. After the public had a chance to weigh in, the original list is expected to remain largely intact but will be slightly reduced from what was first proposed, according to two sources briefed on the plans. According to the report, Trump's aggressive stance calls into question the future of talks between the two trade powers, which took a friendly turn in the weeks leading up to the North Korea summit as the U.S. sought China’s help, but have since deteriorated again. To an extent that is understandable: China was seen as playing a key role in getting North Korean leader Kim Jong Un to the table with Trump, who has consistently linked his trade demands to Beijing’s willingness to help on North Korea; now that the summit is over and the wheels are turning, Trump no longer needs China's aid. And, sure enough, after the summit, while Trump defended his personal friendship with Chinese President Xi Jinping and said he would call the Chinese leader, he also said Beijing has not done an adequate job closing its border to trade with North Korea in recent months, which Trump seemed to blame for rising U.S.-China trade tensions. “Which is a shame. But I have to do it. I have no choice. For our country, I have to do it,” Trump said at a press conference in Singapore, possibly referring to tariffs. “I came away thinking that he was suggesting in the press conference in Singapore that although Xi Jinping was a close friend [and] that he’d provided help on North Korea, that the president had no choice but to turn up the heat on China,” said Scott Kennedy, a China expert at the Center for Strategic and International Studies. That's precisely what is happening, but that's not all. As we reported yesterday, Congress is aggressively pushing back against the White House recently backing off on the ZTE seven-year ban, further complicating efforts to reach a deal with China. The Senate is expected to consider must-pass defense legislation this week that includes an amendment effectively rejecting the decision to roll back sanctions on ZTE. In fact, as the WSJ reports, the ZTE deal "appeared to teeter on the brink of demise" as senior Republican senators signaled that President Donald Trump was unlikely to block a congressional effort to derail a deal he brokered to resuscitate the Chinese telecommunications giant. According to the report, the president hasn’t issued tweets urging Republicans to stand down, and lawmakers detect no backlash building within Congress against the move to unravel the White House agreement. 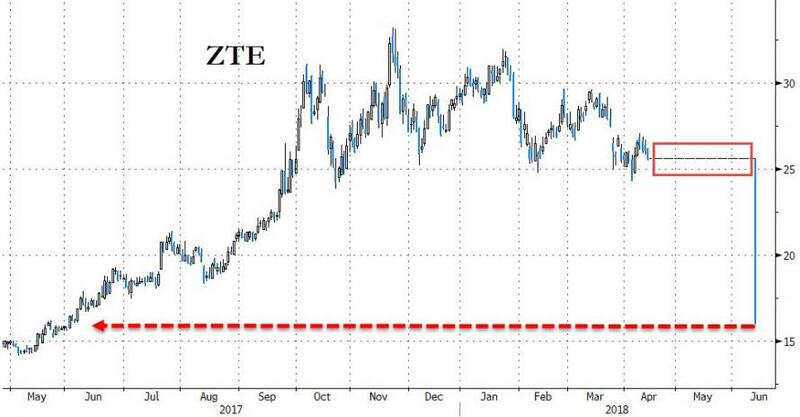 Meanwhile, as we noted last night, ZTE shares resumed trading in Hong Kong on Wednesday morning after a halt of almost two months, plunging over 40% in the opening minutes — their biggest drop in history, wiping out nearly $8 billion in market value — as investors rushed to distance themselves from the troubled company. Trump had spent the previous week in closed-door meetings trying to sell Senate Republicans on the deal, which coincided with his effort to build goodwill with Chinese President Xi Jinping ahead of this week’s talks with North Korea about denuclearization. And in a briefing late on Monday with GOP senators, Commerce Secretary Wilbur Ross again tried to get lawmakers to drop their resistance to the ZTE agreement. However, now that Trump had his moment in the history books with his North Korea summit - whether it is successful or not - expect the old, trade belligerent Trump to make a triumphal return, and the trade war with China to return front and center in the next few days.